Zlatý Bažant 0,0% Dark – the first Slovak dark beer without any alcohol! Zlatý Bažant 0,0% Dark continues the trend of innovations from Hurbanovo. 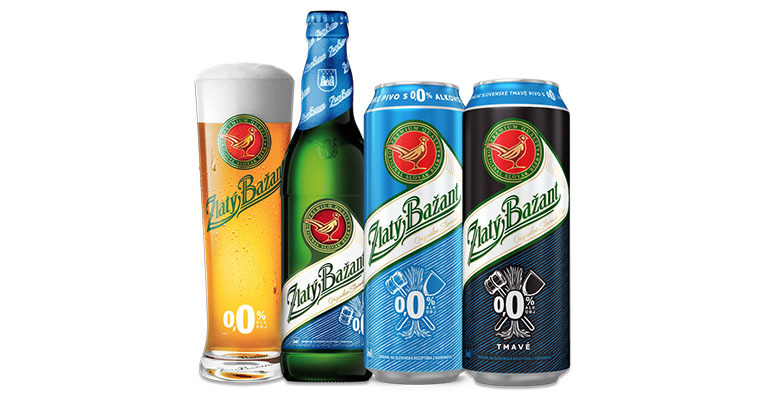 Zlatý Bažant offers a bigger variety also in the segment of beers withou any alcohol. Thanks to this novelty you can enjoy Zlatý Bažant 0,0% as both pale and dark beer. Zlatý Bažant 0,0% Dark, like Zlatý Bažant 0,0% pale beer, is brewed using a method of cold contact fermentation, which was developed and continually improved by brewmasters and brewers in Hurbanovo over almost two years. The dark 0,0% beer is brewed with 4 different types of malt: pale pilsner, caramel, munich and color malt. The right selection of malts gives the first Slovak dark beer without any alcohol its intense malty taste and aroma with the notes of roasted malt. Zlatý Bažant 0,0% Dark beer is available in 500 ml cans in retail stores at a recommended price 0,92 €.